Enveloped, bullet shaped. 180 nm long and 75 nm wide. Negative-stranded RNA linear genome, about 11kb in size. Encodes for six proteins. The viral RNA dependent RNA polymerase binds the encapsidated genome at the leader region, then sequentially transcribes each genes by recognizing start and stop signals flanking viral genes. mRNAs are capped and polyadenylated by the L protein during synthesis. Attachement of the viral G glycoproteins to host receptors mediates Clathrin-mediated endocytosis of the virus into the host cell. Sequential transcription , viral mRNAs are capped and polyadenylated by polymerase stuttering in the cytoplasm. 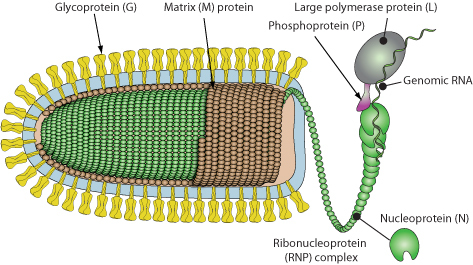 The ribonucleocapsid binds to the matrix protein and buds via the host ESCRT complexes occurs at the plasma membrane, releasing new virions.